This image shows and adult female Rhinella yunga from the area of Rio Huatziroki. It was hiding on Peru's forest floors, with a body camouflaged to look like dead leaves. For toads, the tympanic membrane (or eardrum) is a round, thin tissue that typically sits just behind the eyes. Rhinella yunga isn't the only frog species without this hearing organ. Gardiner's frogs from the Seychelles islands don't have eardrums; a study published last year found that these creatures actually use their mouths to hear. 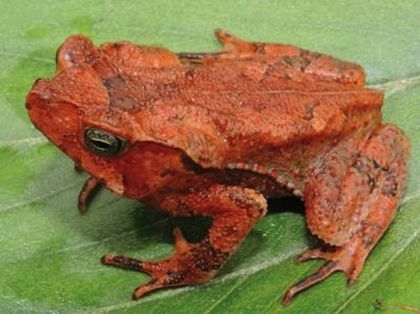 The description of Rhinella yunga, published in the journal ZooKeys, didn't detail how this new toad communicates. The creature's coloration ranges from orange and reddish-brown to yellow and tan, arranged in a pattern that resembles "dark partly decomposed fall­en leaves," the scientists wrote in their description of the frog. So far, the Rhinella yunga has been found around Peru's Yanachaga–Chemillén National Park and Pui Pui Protected Forest, at altitudes between about 5,900 and 7,300 feet (1,800 and 2,230 meters). The scientists who discovered the toad think its distribution likely covers a wider area. They also suspect additional new species may be discovered upon closer examination of frogs that have been labeled Rhinella margaritifera. "It appears that [a] large number of still unnamed cryptic species remains hidden under some nominal species of the Rhinella margaritifera species group," the researchers, led by JiÃ…™í Moravec, of Prague's National Museum, wrote in their paper. With only limited information on the new species, the scientists classified Rhinella yunga as "data deficient" according to the criteria for endangered species laid out by the International Union for Conservation of Nature (IUCN). But frogs around the world have been in steep decline due to a number of environmental threats from fungal diseases and invasive species to the pressures of global warming. Researchers last year found that in the United States alone, amphibians (a group that also includes salamanders, newts and legless caecilians) have been disappearing from their habits at an annual rate of 3.7 percent.